Happy Thursday everyone! How are you all? I've been meaning to do a review of my September Glossybox for week's now but have been trying to try out all of the products before doing so and sadly this month I wasn't hugely excited about everything in the box... (I actually received my October box yesterday... so will be putting an overview of that up very soon!) and it took me a while to get around to it. Balance Me: Extra Care Eye Cream; I am very loyal to my Lush 'Enchanted' eye cream, though I have enjoyed trying this out, I wouldn't say it has made a massive difference as the black bags I have under my eyes never seem to go away, sadly I fear I may always have them (the joys of being so busy all the time!) But it did have a nice consistency and scent and I'll definitely finish the tube. BodyShop vitamin E moisturiser; I used to love BodyShop in fact my Mum often held BodyShop at home parties, but since it was bought by L'Oreal (L'Oreal are not cruelty free), I have been hesitant to shop there/purchase and further products which is a shame as I did love some of their products!I haven't opened this as I'll pass it onto someone else instead who would actually get the use out of it... as I am pretty happy with my Lush moisturiser already. I like the Balance Me eye cream and love the LadyGaga Fame perfume, though apart from that I was a little dissappointed with my box, all of the products were sample size (I know that some other subscribers got one or more full size products...) The next box is due to arrive early next week which I look forward to seeing how it is; I'm going to keep my subscription till Christmas and then decide if I'll continue on with Glossybox or switch to Joliebox. I've two pretty good boxes and recieved some amazing products, so I guess one duff box out of 3 isn't too bad?! 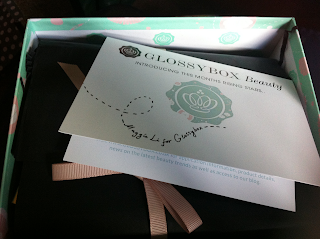 What do you all think of Glossybox? Did anyone else recieve the September glossybox/have different opinions of the products? Today I'm headed to work then off to The Bloggers Pub Quiz this evening, in Glasgow! How exciting :) so sadly there'll be no more posts today... I'm also coming down with a stinky cold, so if anyone has any good cold remedies/tips? They would be greatly appreciated! Sitting waiting wishing... The Spooky Edition. Sitting Waiting Wishing... October 2.